If configured by your account administrator, you can live stream a webinar to a custom platform. If you configure this before the webinar, you can begin streaming with one click after your webinar begins. Sign into Zoom and navigate to Webinar Settings. Click the Edit button for In Webinar Settings​​. Enable the ​​Custom live stream service​​ option. 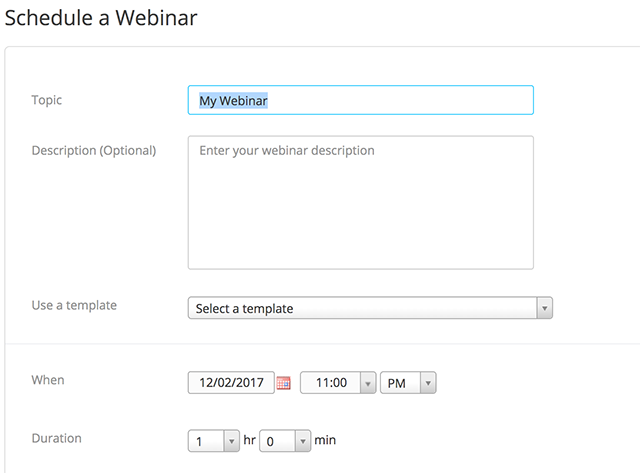 Update the instructions so that the webinar organizer can configure the required settings when they schedule the webinar. Sign into Zoom and navigate to the ​​Webinars​​ tab. Click ​​Schedule a Webinar​​ and then update the basic settings that you need. Click ​​Schedule Webinar ​​to display a set of tabs with advanced options. Click the ​​Live Streaming​ tab, then click the ​configure live stream settings​​ link. Follow the instructions located in the green box, which were provided by your administrator. Contact your administrator if the instructions do not include sufficient information. Click ​​Save ​​to save your live streaming settings. The meeting host will be able to live stream this webinar without needing to add these settings after the webinar begins. From your calendar - If you have added the webinar to your calendar, click the link displayed on your calendar reminder. Click the ​​More ​​button in the Host Controls. Choose ​​Live on Custom Live Stream Service​​. If the organizer configured this webinar for live custom streaming, a browser window opens that shows the progress as Zoom prepares the live stream of your webinar. If the organizer did not set up this webinar for live custom streaming, you must enter the values provided in the instructions.